It is great when movies played on iPod in widescreen with stereo sound. Purchasing movies from the iTunes Store ready for iPod seems too much waste if you already own the DVD. So why waste your money on the same movie a second time? This article offers a brand new way to watch movies on iPod by taking your own DVDs, your friend's, even rented ones. We can learn that iPod only reads MP4, so we need the third party software to convert DVD to MP4 format, and then transfer the converted MP4 video to iPod. 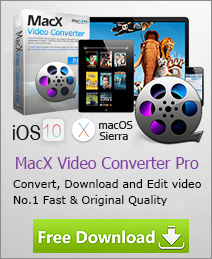 MacX DVD Ripper Mac Free Edition is a powerful yet 100% free DVD iPod converter, can easily convert DVD to iPod MP4 with high quality that compatible with iPod (ipod Touch 6/5/4/3/2/1, iPod Shuffle, iPod nano etc), as well as iPad Pro/Air 2/mini 4,, iPhone 6s/6s plus/6/6 plus, Android phones and tablets, etc. Unlike traditional free DVD ripper, this free DVD to iPod converter empowers full access to protected DVD movies by getting rid of the copy protections, including CSS encryption, Sony ARccOS encryption, RCE Region protection, etc. Best free iPod ripper software to free convert homemad and protected DVD to iPod, iPhone Pad on Mac (El Capitan) in MP4, MOV, iTunes, etc with no quality loss. Step 1: Insert your home DVD or commercial DVD in your computer, run this DVD iPod converter and import DVD source. Note: This free DVD to iPod converter supports two DVD input forms. You can either click "DVD Disc" button to import DVD content from disc or "DVD Path" button to import DVD folder saved in your computer. Step 2: Choose "to MP4". Of course you could also choose "to iTunes" for your iPod. Step 4: Hit the "Start" button and go! Besides, this best gratis DVD iPod converter can also rip DVD to MOV, DVD to MPEG, FLV, MP3 music. If you are not satisfied with the supported output formats of free version, or longing for more output format, you can try the upgraded version - MacX DVD Ripper Pro with lifelong update to always support the latest copy protected DVDs. This guide article will show you how to convert and import DVD to iPod Touch 4 format on Mac OS. With MacX iPod DVD Ripper, you will know how to rip and convert DVD to iPod Touch 4 on Mac OS at ease. 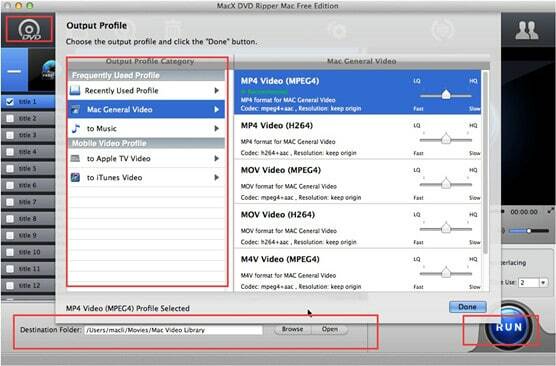 How to rip DVD movie free on Mac OS? This free DVD Ripper for Mac helps you free rip DVD movie to MP4, MOV, MPEG, FLV, MP3 on Mac and convert DVD to iTunes video format for playback on iPhone, iPod, iPad, etc.